The complex of Gasoline Plant units and facilities was built in a very short period of time. In 2003, TAIF PSC started construction, and as early as February 2006 the first batch of products was produced. Commissioning of this large-scale production facility became a unique event not only for TAIF Group and the Tatarstan Republic but for Russia as a whole. The first Gasoline Plant in Tatarstan, with a design capacity 880 thousand tons of vacuum gas oil per annum, is able to cover over half of the Republic’s demand for motor gasolines. A major part of installed and commissioned equipment was ordered from the plants in the Russian Federation and the Tatarstan Republic. All the compressor equipment, a significant number of pumps, control systems and process safety systems were purchased by TAIF PSC in the USA, Europe and Japan. The technology of motor gasoline production out of vacuum gas oil from crude distillation complies with all modern global standards in terms of process flow sheet structure and hardware. It has maximum protection from emissions and sewage, is located on land areas in a space-saving manner and is managed by up-to-date electronic control and protection systems. Its general design engineer is OAO VNIPIneft. The development of a reactor section, reaction product fractionation and process condensate treatment technologies was performed by OOO Elistek Engineering. OAO VNII NP developed a design for a catalytic cracking gasoline hydrotreatment section. The specialists of OAO VNII NP performed the development of formulations and technologies for Normal– 80, Regular – 92, and Premium - 95 grade gasoline production and dealt with the issues of certification and production permits. All the capital investments were financed from two sources – from TAIF’s PSC funds and from a long-term credit facility provided by Sberbank of the Russian Federation. At the beginning of 2007, a revamp of a sulphur compound treatment section (designed for sulphur treatment of light PP, BB fractions and NK-70 gasoline) was completed, which made it possible to decrease significantly production costs as well as to bring the quality of motor gasolines, in terms of sulphur content, to the level meeting Euro-4 standards. 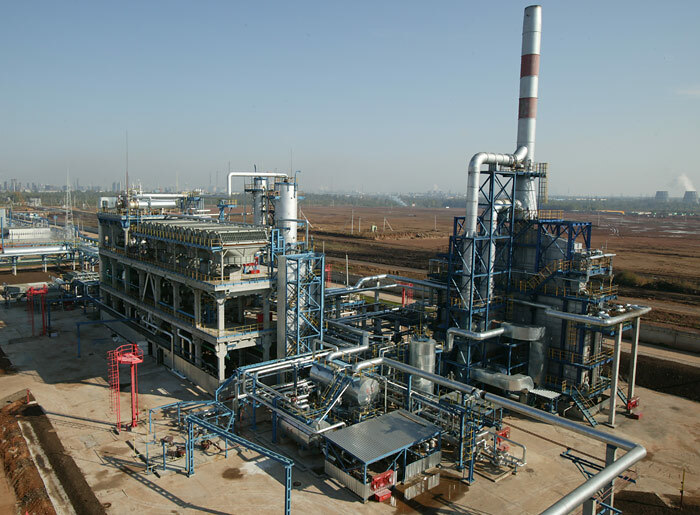 According to the results of operations in 2007, 2008 and 2011 based on feedstock procurement quality monitoring, OAO YATU awarded TAIF-NK PSC Gasoline Plant the title “Excellent Supplier”, the supplied product is heavy gas oil from the Catalytic Cracking Unit. As of 1 July 2015, the gasoline plant produced over 5 mln ton commercial gasolines. In May 2008, a compliance certificate was issued for Regular Euro-92 and Premium Euro-95 grade gasolines in accordance with the standard GOST P 51866 – 2002 according to a European standard EH 228 – 2004 adopted by the European Committee for Standardization. Since June 2008, the customers are provided with high-octane commercial gasoline meeting the requirements of ecological class Euro – 4. In January 2009, an etherification unit was put into operation at the Gasoline Plant in order to produce high-octane components of commercial gasolines– MTBE out of isobutylene contained in the butane-butylene fraction from the Catalytic Cracking unit and TAME out of isoamylenes contained in the light gasoline fraction from the Catalytic Cracking Unit. The MTBE synthesis reactor section design capacity is 24.8 thousand tpa. The TAME synthesis reactor section design capacity is 152.8 thousand tpa. In November 2009, the MTBE unit reached its design capacity as related to feedstock processing and finished product output. Regular -92 and Premium Euro-95, commercial products produced at the plant are acknowledged to be diploma winners of Contest “100 Best Goods of the Republic of Tatarstan" in nomination "Technical and Industrial Goods". In 2016, column K-305 revamp was completed with the full replacement of valve plates for Sulzer plates and an increase plate number from 30 to 36 pieces, which allowed increasing the reflux rate for irrigation of K-305 column, and thereby improve the quality of separation of PPF and BBF. octane number is increased by MON. During the overhaul period of 2016, a change of the feed supply system to reactors P-810 / 1,2, TAME production, was introduced which resulted in reduction of the negative effect of catalyst poison on fresh catalyst, in preservation of conversion of the feed target components, and the extension of catalyst life. During the overhaul period of 2017, in order to improve industrial safety at the catalytic cracking unit, the pipes of the 4th pump around section of the main distillation column K-201 were replaced. Replacement of cyclones, I and II stages, in the regenerator P-102 of the reactor block was carried out, which allowed a removal of the cracking catalyst into atmosphere and, accordingly, and reduction of the negative impact of production on the environment. Construction of TAIF Gas Condensate Processing Unit started in May 2005. Design documents were developed by the specialists of the RDI, SamaraNefteKhimProject. Prompt construction made it possible to commission the unit in a year time, and in July 2006, new products were produced. Production facilities #2 include the Gas Condensate Processing Unit with an output of 1 mln ton per year, a double-sided loading and receiving rack with weighting bridges, an automobile automated loading station and a complex of utilities with a compounding section and a commercial gasoline storage farm. The major part of the equipment installed and put into operation was domestically produced. Replacement of cyclones, I and II stages, was performed in the Regenerator of P-102 Reactor unit, which allowed avoiding removal of the cracking catalyst into atmosphere and, accordingly, reducing the negative impact of production on the environment. To reduce concentration of methanol in the fusel water, Kt-825 column was modified and the plates were replaced, which allowed avoiding a negative impact on the ecological situation. 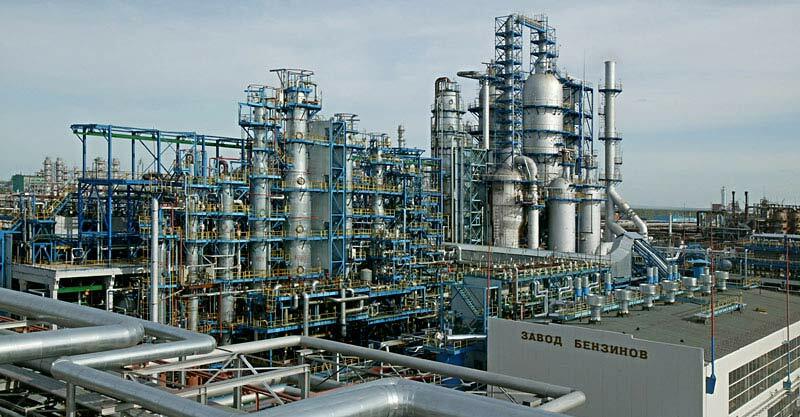 In 2007, OOO NPF "EITEK" carried out work on the revamp of gas condensate processing plant, which allowed expanding the list of products produced. The gasoline plant started producing technical kerosene. Mazut produced at the gas condensate processing plant is used as a component of the heavy fuel oil or as a feed for the catalytic cracking unit of the gasoline plant. The propane-butane fraction (C3-C4) is exported through the pipeline to PAO NizhneKamskNefteKhim. Technical kerosene is shipped to customers. In 2011, re-piping of the heat exchanging equipment and the circulation loops of the product pipelines was performed at gas condensate processing plant that allowed improving the operation of the feed heating unit. In 2012, jointly with OOO NPP NefteSintez, a program was carried out to isolate corrosive elements in heavy gasoline fraction of K-3 column by using THIONOL catalyst in workshop No. 04 (gas condensate processing plant) in order to obtain a stable result on quality of stable gasoline in terms of copper plate corrosion, class 1A, according to GOST 6123. According to the achieved positive result, this technology is implemented in production. 454 729 ton of feed was processed at the gas condensate processing unit in 2014. Apart from the existing loading arms for commercial gasoline, additional 4 loading arms were commissioned for automatic filling station, which facilitated an increase of shipment of commercial gasolines from the automatic filling station of Shop No. 07. 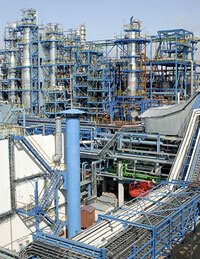 In 2009, a testing laboratory at the Gasoline Plant was awarded a diploma “2009 Competition Laureate. For the Best Achievements in the Field of Tests (Measurements)” in nomination “Testing of Oil Products” in the Republic of Tatarstan. The laboratory at Gasoline Plant underwent unscheduled accreditation in the field of oil product testing for measurement winter diesel fuel lubricating properties and MMA measurement in commercial gasolines. Based on the results of participation in annual interlaboratory comparative testing carried out by FGU Tatarstan Centre of Stardardization, Metrology and Certification, the testing laboratory at the Gasoline Plant has again demonstrated high professional level.